So amused was I at the time that I submitted a letter to the editor of the Simcoe Reformer (which they published) thanking the government for a good laugh. Most of the new labels were not funny at all, but that one summed up the campaign nicely for me. Fast forward some years later and they’re at it again. Graphic warnings covering 50% of the front of the package didn’t stop people from smoking, so now they’re rolling out larger and more gruesome pictures covering 75% that they hope will scare people away. Here is a sample of one of the new packages. 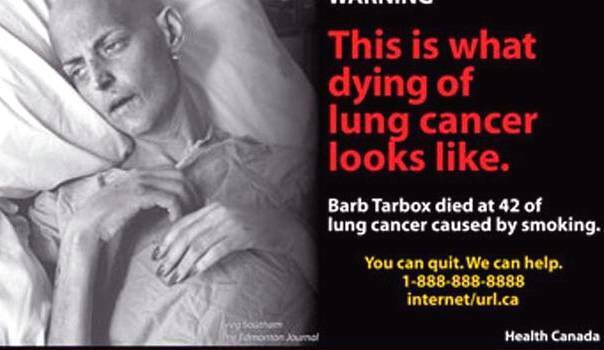 It’s an alarming picture of anti smoking activist and former smoker Barb Tarbox as she lay helpless on her death bed with lung cancer. 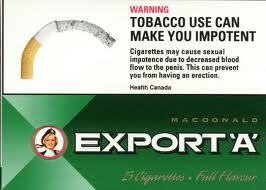 She died in 2003 at the age of 42, and her family lobbied the government to use this picture on our smoke packs. 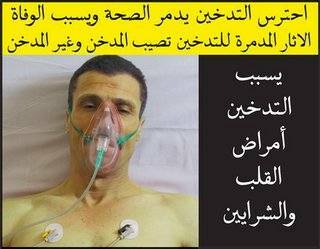 It’s a horrifying reminder of what awaits many of us who smoke, but it will not stop smokers from lighting up for 2 reasons. The first is that we already know what we’re doing to ourselves. There are perhaps a few people who have been living under a rock that don’t realize smoking is bad for them, but most of us have heard it all before countless times, and we will become desensitized to the new packaging fairly quickly. The second is this. Where is the huge graphic warning on the contraband bags of “rollies” that our government has allowed to infiltrate mainstream society? They’re very easy to come by, can be purchased by children with ease, contain such savoury ingredients as insect eggs and human feces, and can be purchased on the streets of any major city for $20 or less per carton. If the aim of this campaign is to stop children from lighting up, why is there no government imposed warning on the most commonly available cigarettes to children? Anyone who chooses to believe that these illegal Native rollies are only available from a Reserve or the illegal shacks surrounding Caledonia should spend a little time having a smoke on a busy downtown street in the major city of their choice and see how long it takes for someone carrying a backpack full to offer them a $20 carton of smokes. The idea of large graphic warnings of the perilous providence that awaits aging smokers is not a new one. A condemned senescence is all but assured by this Egyptian warning label which is the most alarming that I could find, but I still enjoyed the cigarette I had while looking at it. So potent is the addiction to Nicotine that they can cover 100% of the packaging with as many frightening pictures of the gruesome death that is likely awaiting me and I’m not going to stop. 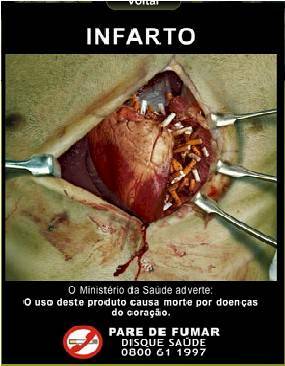 This Brazilian warning label is another great example. I don’t much care to end up like that, but I’m going to light up while looking at it. As the advertising grows more gruesome, the bureaucrats will pat themselves on the bum claiming to be butting out teenage smoking while the kids buy extra foul completely unregulated floor scrapings from China full of insect eggs and human feces with few if any warning labels and nothing but a future of addiction and disease to look forward to. Looking back I don’t believe that the newly minted warning labels would have done much if anything to stop me from taking up the habit, and that was long before $10 cartons of rollies became a fact of life, but while researching this story I found 2 video’s that I’m almost certain would have stopped me in my tracks as a teenager who thought it was “cool” to smoke. I didn’t intend to cover the topic here of what Canada could do if they really wanted to curb teen smokers, but here’s one example. Instead of laying out millions for pictures that kids will acclimate to quickly, spend a few bucks to show the following 2 video’s in schools, and on television on a regular basis. Be forewarned that these are hard to watch. What began as a tongue in cheek look at ineffective Government warnings from the smokers point of view has left even me wondering if it may soon be time to try (yet again) to quit. The first is an Australian TV ad that is absolutely horrifying and is thankfully not in high definition. The second is an independent silk screen animated video made by a woman who watched her Mother die of lung cancer. Had I been shown either of these on a regular basis as a child, I’m not at all sure that I’d have ever picked up a cigarette, but so long as Canada sees this as a cash grab rather than a problem, and so long as we allow cheap contraband tobacco to account for an ever increasing percentage of the market, kids are going to light up. If someone you love is struggling with a drug or alcohol addiction, remember that your loved one stands a better chance of healing and bouncing back from substance abuse with the help of Alcohol and drug rehab programs.